Web/Scramble: All Elite Frigate types. Spy frigates only webs. 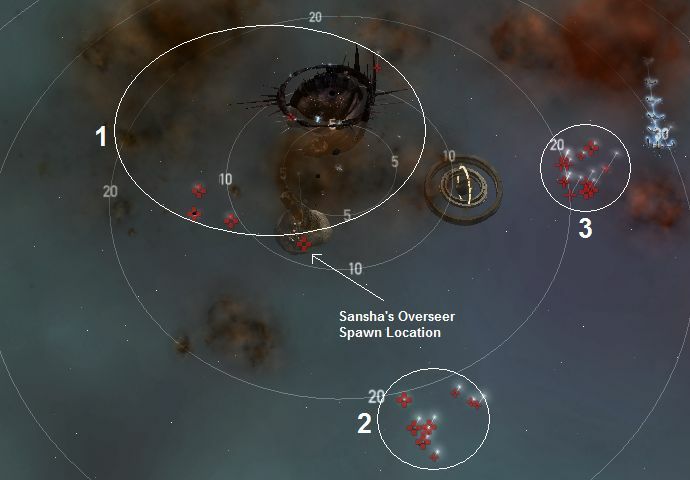 Note: Heavy drone aggro in Angel & Sansha Pocket 2. Setting drones to passive in order to avoid accidental aggro is recommended. This is not a drone friendly mission. However, one thing I notice since the AI update is a "glitch". If you do not shoot anyone, and you release more than one drone shooting at one target. Once they start shooting at one of your drones you can scoop that drone back into the bay. The foes should not shoot at your other drones. This "glitch" maybe fixed down the road. This is a time consuming mission if you do both the Angel & Sansha sides. The two gates are locked until you kill the trigger ship from each faction. The trigger ships are ALWAYS a Gist War General and Centus Savage Lord from the respective groups. NO aggro from the initial groups until you attack them. Each group can be aggroed independently. Drones can be safely deployed to attack any group with aggroing the entire pocket. NOTE: I notice since the AI update the ships react to the type of drones you use. While using long range sentry drones the foes try to get out of the drones ranges by getting closer. While using short range sentry drones the foes try to move away. The NPC ships will not travel more than 30km from their respective spawn points. Drones/fleet members maybe targetted as the NPC ships reset their targetting when moving back to their spawn points. Move to a sniping position near the respective gate, roughly 75-80km (recommended distance) from the Angel Asteroid Outpost or Sansha Watchtower. They will travel back and forth in a merry-go-round while you snipe. On warp-in, Group 1 will auto aggro. The Angel Spy frigates do not scramble but they do web. DO watch for Thugs and Outlaws srcams. 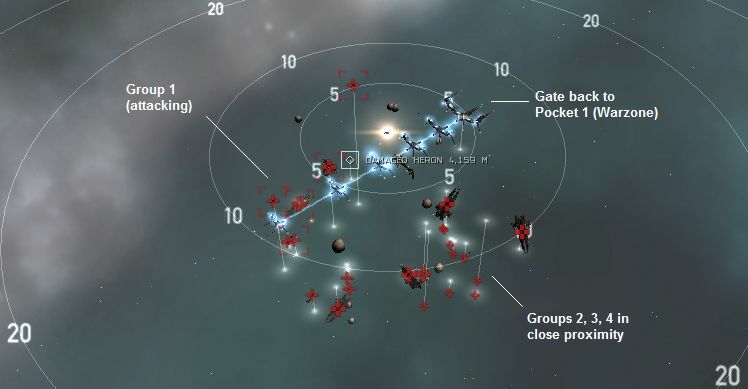 All ships in this pocket have to be destroyed to unlock the gate. Any attack on the Angel Spy frigates by fleet members will aggro the entire pocket. It is safe however, for them to kill the sentry guns in Group 1. The FIRST ship that had warped into the pocket may kill the Angel Spy frigates without repercussions, as long as you stick to turret weapons/missiles. NO aggro from the other groups until you attack them. Each group can be aggroed independently. Once Group 1 has been eliminated, it is fairly safe to deploy your drones for the remaining groups. Keep a close watch on your drones’ target to ensure that they do not stray and mistakenly attack a neutral group. Recommended order for elimination : Group 1, Group 2, Group 3 and finally Group 4. An Angel Overseer battleship will have a random chance to spawn in this pocket. The chance to spawn seems to be based on triggering the Angel Base warp gate in Pocket 1 and then completing the warp into this pocket. On warp-in, Group 1 will auto aggro. The Sansha Spy frigates do not scramble but they do web. DO NOT deploy your drones to attack Group 1. Any attack on the Sansha Spy frigates by fleet members will aggro the entire pocket. It is safe however, for them to kill the battleships in Group 1. The FIRST ship that had warped into the pocket may kill the Sansha Spy frigates without repercussions, as long as you stick to turret weapons/missiles. Recommended order for elimination : Group 1, Group 2 and finally Group 3. An Sansha's Overseer battleship will have a random chance to spawn in this pocket. The chance to spawn seems to be based on triggering the Sansha Base warp gate in Pocket 1 and then completing the warp into this pocket. You will warp-in randomly around 5km from the Heron. In addition to the immediate aggro from Group 1, there is a small chance that one or more other groups will aggro due to proximity triggers. If this happens, start moving away from the remaining neutral groups and check if the webbing/scrambling Elite Frigates have you locked. Kill them first if they have you locked. If you are fleeted with friends, have them focus fire on Group 1 or any groups that have been aggroed by mistake. The FIRST ship needs to act as an Fleet Commander and assign the appropiate targets. A common mistake is to have everyone shoot random or their closest target, which leads to the whole pocket being aggroed. NO drone aggro for the entire pocket. You can deploy drones normally. Warping-in from either Angel or Sansha Base does not change the ship combination for this pocket. It will always be Angel ships. Pocket 1 : Unlock the Angel Base gate either using a Zbikoki's Hacker Card (or killing the Gist War General). The card will be consumed upon activation. Pocket 2 (Angel Base): All ships in Pocket 2 have to be destroyed to unlock the gate. Pocket 3 (Research Outpost): Destroy Group 1, grab the hostages from the heron, fly back to your agent. No need to destroy entire groups. - confirmed in July 16, 2014. The Zbikoki's Hacker Card can be found in Zor's wreck in “RightHandofZazzmatazz4 The Right Hand of Zazzmatazz” or "DamselInDistress4 Damsel In Distress" Level 4 mission. This video is one of many ways to do this mission. (The game got super glitch during the video. (I gave the GM a heads up) Anyways, I'm going to redo this mission down the road)I did leave out the fact you need to pick up the guys and bring them back to your agent. warp in: I've found you can unlock the gates to the cartel base just by killing the gist BS, so unless you are a die hard everything dies player you can leave the frigs. It is safe to shoot them here. If you are fleeted with someone, then, if your companion tries to attack Angel Spies in Angel Pocket 2 or Sansha Spies in Sansha Pocket 2, all the rest of the Pocket aggro him, scrambling and doing serious DPS. Easy to lose a ship. Once Angel Spies/towers are dead, other enemies can be safely engaged, it doesn't cause whole room aggro anymore. Full agro in angel pockets can be done with a heavy tank oriented apocalypse navy issue, my tank was this one : 2x explo hardeners , 1x kin hardener 1 , 1x Thermal hardener, 1x energized adaptive nano membrane, 1x LAR, 2x auxiliary nano pumps, 1x ccc. 2 heat sinks for and 8x mega pulse lasers do just perfect upto 32km with ultraviolet crystals helped by the drones (for saints, i.e). I am finishing this mission now, Apoc, 2 kin/EXP hardeners, 2LAR IIs, 8 mega pulses, tanking was no trouble, but the DPS is pathetic with lazers, and it takes a while to kill anything, overall, personal mission rating, easy if using common sense. It bears notice what happens when you take on the webbers with drones. It does not lead to mass aggro... not against your ship that is. Rather, any drone that attacks the webbers will get aggroed by the whole pocket. As the ships are all rather close, drones will die rather fast. The Group 1 in the Pocket 3 does not Auto-aggro. It also aggro by proximity trigger (But you usually warp into it's proximity), so when you warp in it is advised to stay put for a while to see who actually aggroes. Even tho' it's rare I've managed to warp into that pocket few times getting no aggro at all. I found I couldn't use drones in Pocket 1, the rats switched aggro to the drones one or two at a time. If you depend on drones only (like I do) then just take the hacker card and skip shooting stuff in the first two pockets. Also, watch the proximity trigger in Pocket 2-- I found the group closest to the gate on the Cartel side aggroed about the last 5km to the gate without attacking anything in the pocket. The three larger asteroids in the Angle Cartel base are 90k veldspar. There are a smattering of small asteroids too (less than 15k Veldspar). The first pocket of this mission is now different. On the Angel Cartel Side, for BS, I have 1 Gist Commander, 1 Gist Warlord, and 1 Gist General, so the trigger is different. Sansha pocket 2 group 3 DEFINITELY has a proximity trigger... they almost killed my raven when I approached the gate and didn't notice them attacking. The warp scram didn't help either. I can confirm that there is definitely a proximity trigger on the group closest to the gate in the Angel side. I was blitzing it with my CNR (so I could go to bed) and as I approached about 2km from the group they all began to open fire (I shot nothing but the sentry guns). They did not warp scramble however and I simply just took the gate into the last pocket. Just a reminder for those of you who may have gotten complacent killing Sanshas: The Sansha base has the potential to be a ship killer. If you're not careful, you may aggro 10 battleships plus assorted rabble. Not good; however, group one does not scramble, groups two and three can be aggressed separately. Don't bother trying to kill the little web drones--begin by killing the Beast Lord which can tracking disrupt you, finish off the battleships in group one. Start with the Beast Lord in Group 2, do the cruisers and battleships; then aggress group 3. You can now deploy drones and swat the scramblers et al. while shooting the rest of the group. Be patient, fly safe. This will take a long time, especially if you've loaded tank-heavy. I'm using a Navy Issue Apoc. In the lows: 3 heat sinks, 2 thermal, 2 kinetic hardeners II and a LAR II. Correct shield hardner for each pocket is important. I use a rail (Blasters might be better or not) fitted rokh with T2 stuff and nav ammo. An afterburner is worth the slot, and you need lots of ammo too. The mission takes time. So don't make any plans for the next few hours. Very very hard mission. Watch your agro!!! Pocket 2 (Angel): You might need to sacrifice drones so you can get some distance at the start (Angel spy) or tank them if no web. Maybe take out a group or two first. Warning: Group 4 warp/web scrambles like mad. Frigates are though to take out. (Lots of dps in here) If you mess up. Warp out immediatly and warp back in and start over. Pocket 3: Get distance while shooting at group 1. Not all the pocket will agro at once. So shoot one ship and wait. Be careful they hit like a hammer. - Overseer, when it spawns, will cause pocket aggro when shot. Even if you shoot him from 40 km away. - It's not true that you cannot use drones. You can get to 20-25 km away, there's a building ahead of the warp arrival point that can be used as reference. Then you can shoot at the two auto-aggro Angel Spy frigates, as long as the roaming other frigates (group 4's) don't cross your drones path. When this happens, I never got them to aggro but they aggro the drones and kill them in few seconds. By watching the roaming frigates path so that they are 18km or above away off you, you can attack the two webbing frigates at will. Every time the other groups closes in again, you have to recall the drones fast. *WARNING* Do not try to run the pocket 2 Sansha's room in a t3 cruiser(Legion). You will be webbed and srammed by many frigs after attacking the first webber and will draw full aggro. May have been a proximity thing as I was approaching the gate? For me, pocket 3 was consisted entirely of Blood Raiders, NOT Angels. Be prepared to warp out quick if you're equipped for Angels. The pocket was not too difficult once I came back with Blood gear. From my recollection, the pocket had 3 groups. Group that auto-aggroed consisted of 3 elite cruisers and 2 battleships. The other two had cruisers/BS and also some frigates with web/scramble. The groups were very easy to tank one at a time. No problem using drones either. I've noticed that the mobs will only agro your drones, if you have 4 or more deployed. As long as I only kept 3 out, and they didn't go fight mobs that weren't already agro'd, then I had no problem. Done (Sansha side only) in an Apocalypse with Mega Modulated Pulse Laser (2 * LAR, Sansha => 2*EM +1*Therm T2 Hardener, Infiltrator II Drones), Pocket 3 ( 2*Explo+1*Kin T2 Hardener, Valkyire II Drones ), needed the 2nd LAR only at Sansha Base, saved the spies until Groups 1+2 where done, they dident webbed. In Pocket 3, the BS for Group 2 and 4 used Target painters, no initial aggro from Group 1. (shoot Group 1-2-4-3). Did mission in a Legion with no problems. Actually had the Zbikoki's Hacker Card and warped into Angel with no overseer spawn so warped out and did Sansha side to find the overseer spawned (didn't drop anything). Nearly lost my ship in Angel final pocket. 3 points on my Machariel upon warpin and most of the pocket aggro. Fortunately the group with 3 BS' did not aggro so the total dps was tankable (overloaded) long enough to get rid of the points and gtfo. If you bounce off the gate in the final room and don't have an ubertank, GTFO. The sansha overseer had a 3.75mil bounty and absolutely melted to my ravens 330 dps(only just trained into it ^^), went down in about 20 seconds. Dropped a true sansha crystal tag, sansha radio L and an assortment of other equally worthless mods. The angel overseer had a bounty of slightly less than 1 mil and was the same as a normal bs to kill. Dropped a few meta 0 mods, not even a tag or faction ammo. Just to show you don't need a massive battleship tank, for kicks I took my armor/speed tanked Dramiel into this mission to deal with the first two webber frigs in room 2. I figured why not stay a while and take down as much as I could. So with a full room agro on me, I managed to deal with all the frigs, cruisers and battle cruisers. Battleships were a different matter, just not enough DPS. For them I had to grab my Machariel. Faction ships are just the best toys ever. I found taking out the webbing frigates in room 2 to be a pain. So I ignored them, took out the turret guns, then the remaining groups in order. When I started on group 4, I launched small drones to take care of the web frigates. Also in the final pocket, there was no auto-aggro. I couldn't easily tell groups because everything was so close (within 10km or so), so I burned away, picked one thing, shot it, then it's group when they aggroed and so on. I only did the Angel side, RL got in the way before I could go back and do the Sansha side, but it was pretty easy with an anti-Angel tank fitted. Just done this again and had Sansha Overseer. If you don't attack it, it remains passive until the end. It dropped a few True Sansha faction bits that are OK, but also 2 bits of t2 salvage worth 25M each! That was very nice. Angel/Sansha Overseers (supervisors as they now call them) and how to get them. Just farmed this mission and got both Overseers every time. Bare with me if this description is waffley, what to do is easy but describing it well is more tricky. Sansha first (though the principle is the same for each). After killing all Sanshas make sure you are over 5km from Sansha gate between the gate and the Sansha base, approach the gate manually (by double clicking in space just ahead of the NARROW end of the gate. Travel to just beyond the NARROW end of the gate so your ship will be flying perpendicular to the direction of the gate. Once within 2500m, hit warp. This should cause Sansha Supervisor spawn. Angel second. Again, you want to be between the Angel Base and the Gate. Manually fly your ship so it is parallel to the direction of the gate. Fly along side the gate till you reach just beyond the NARROW end of the gate, then cut across the gate so you are flying perpendicular to the direction of the gate. Once within 2500m, hit warp. This should spawn the Angel Supervisor. Do not use the gate icon to approach as this takes you to the BROAD end, when approaching. Only use it when you have arrived and wish to initiate warp. Farmed this for 2x 7 days now. The stategy to spawn both supervisors by Radagan worked every time...how does that work??. Have only got 5 supervisors over 1m bounty. Of these lot, 4 supervisors only had faction amo drops, but one dropped 3 faction items, 625mm autocannon, EM shield hardener and cruise launcher. 2012-07-06: Did this mission to find the last pocket can be blitzed. Upon warp in Group 1 aggro'd, blew them up and then looted the Heron. No need for me to kill the rest. As for Radagan's claims, the last couple of times I've done this mission and its variants there have been Supervisor's in every "Base" pocket. Nothing fancy needed, although most of the time the bounties were pretty low. I can also confirm what JubisMoonjuice said. It is possible to blitz final pocket. I have been farming World's Collide with the trick RadaganSchneider described for a few months now. People have been asking so I put up a video to show where you are supposed to activate the gates from. Hmm, a lot of people seem to be saying you always get Supervisor spawns nowadays. Guess they changed something then. I have done as RadaganSchneider suggested and got both Supervisors. I prefer the other less reliable way to get the big bounty ones though. Loot and salvage as of today (killing 2 Supervisors): 28.3M. No Veldspar in Sansha Base pocket. Did this today after Retribution patch, pocket 3 aggro'd comletely and dropped me to 20% Armor within a minute in a Deadspace fit Napoc. Definatly broken, be careful. Can confirm this, be extremly careful in pocket 3! Stage aggro, 3-4 webbers and 2 scramblers, which are on you instantly. Also, since the release of Retribution, rats switch to your drones quickly! If you loose your light drones, you won't be able to kill the scrambler frigs. Nearly lost my Macha, got out with less than 20% structure. Align to something, so you can warp out. Just did the last pocket in a well tanked Vargur with high resists. The DPS is heavy but not insane. Make sure you align as soon as you warp in. Target the frigs first and take out the elite frigs ASAP. I was webbed but i didnt see any scraming. Very easy, but it takes a long long long time to get it done in a drone boat. This mission is more for those with guns than drones. is the method described by RadaganSchneider still viable after todays patch? i seem to be unable to force any spawns, but i might be doing it wrong. My method is. I'm doing it right now. As of 6-12-13, the second room must be cleared in order to activate the gate to the research station. Shooting the towers doesn't draw aggro and shooting the angel spies still doesn't draw aggro, however, as soon as you close in on the gate, the gate group aggros you immediately and the gate gives the "clear the pocket" type message. does RadaganSchneider's way still work? i did it exactly, but both supervisors didn't show up. I could not get the supervisor spawn method as described by RadaganSchneider to work.